Sometimes it is hard for you to do anything. Whatever you start trying, you feel too tired to finish. It is when your body has no energy to act naturally. If you want to get rid of such days, let us find out the reason why you have no energy and best ways to boost it. Why Do You Have no Energy? What Drinks Can Provide You with Energy? Does Exercising Give You More Energy? Nowadays there are so many things you can and should do, it often feels like you do not have time for what you like at all. Nevertheless, you try to include these pleasant activities to your daily regime. For example, you will most possibly watch another episode of your favorite show even if it is a late evening and you have to go to work tomorrow. It is the first and most possible reason of having no energy. When you go to bed in the latest evening and wake up in the earliest morning, your brain and muscles have no time to rest. It is like if you were charging your phone only by 30% all the time. It can do something, but not for a very long time. Another reason for lacking energy is junk foods. When you do not consume enough vitamins, your body cannot work well, as it needs many useful substances to build new cells. This effect is enhanced by a sedentary lifestyle, as if you do not move enough, your muscles get tired faster. Nevertheless, lacking some energy may have only a psychological reason. When there are too many things that have to be done, it feels like you are not capable of doing anything. No matter what is the reason of your lacking of energy, we will discover many ways to boost it. Everything mentioned in the following paragraphs works well for everyone. We have made a list of the best ways to boost your energy, according to problems we have discussed before. You may try anything you like, just make sure it does help you and makes you feel lively. Having a proper diet is the most important thing that affects your health. If you receive enough carbohydrates, proteins and some vitamins, your energy will always stay at the high level too. That is why we have gathered the most energizing foods in the list below. Eat any of these regularly, and you will less likely feel tired. Manganese is the most important element to help your body produce energy. With the lack of it, you feel tired and depressed. The best food to contain it is brown rice. It can be cooked and served in dozens of different ways, which makes brown rice pretty versatile for any diet. Sweet potatoes are better for getting energy than usual ones because they contain more carbohydrates. In addition, there are many vitamins in them, including A and C.
Vitamins A and C are best substances to fight fatigue. As for rice, sweet potatoes can be cooked differently. Just choose the way that fits your diet and tastes perfectly. Just one teaspoon of honey is a nice and natural energy drink equivalent. It is due to a low glycemic index of this product. All the carbohydrates are absorbed in blood slowly. Therefore, if you eat some honey in the morning, you will have energy until the end of the working day. Bananas are high in natural sugars: sucrose, glucose and fructose. There is also a lot of dietary fiber in them. So, if you eat some as is or add bananas to your morning cereal, you will have enough energy for a few hours. Take some with you as snacks too; these fruits are beneficial for health in any amounts. Apple is truly one of the most health-beneficial fruits. Talking about energy, it is also one of the best. Apples contain a lot of fiber, just as bananas do. Moreover, there are also many vitamins in them that affect your energy production. A unique composition of apples makes them very useful for getting some energy. To complement the fruit snacks list, oranges are best. They contain a really huge amount of vitamin C, which, as we have mentioned, is a nice energy production catalyzer. What is interesting, eating an orange you do not get all the energy immediately. This fruit gives it to you steadily while being digested. Spinach is good for energy boosting as well, as it contains a lot of iron. This element is needed for many systems of your body, including nerves and muscles. So, adding spinach to your regular meals is a good idea if you want to stay vigorous for the whole day. Chickpeas, green peas, lentils and many others are all very useful if you need more energy. These products are high in proteins and carbs. It means you get both calories for your organs and amino acids for muscles. This way you will be full of energy, eating a healthy and tasty food. You have probably heard a million times that salmon contains many omega-3 fatty acids that are useful for lowering cholesterol in blood. However, it is not the only feature of the fish. Salmon is also high in protein content; and the vitamin composition (especially B group) of it is outstanding. This makes salmon a truly beneficial product for many reasons, including energy production. 97% of proteins contained in eggs can be fully absorbed by your body. This makes them the most beneficial product for your muscles, as two chicken eggs contain 30% of your daily protein intake. Therefore, if you eat some for breakfast, you will have enough amino acids to spare until you get home and have a dinner. In addition to foods, there are also some drinks that can give you a lot of energy. We have made a top 5 best ones that are both efficient and healthy. There is nothing to invigorate better than water as it is. A glass of pure cold water can refresh your body and thoughts nicely. Moreover, it is important for health to drink 3 liters of water per day. It is possible that your usual feeling of lassitude is a simple thirst. Therefore, always carry a bottle of water wherever you go. If it is ok for you to consume caffeine, than a cup of espresso can provide you with some energy. Caffeine makes your brain work faster, therefore refreshing your thoughts. However, notice that this effect is immediate but temporary. After a few hours, you will want to sleep even more. So, do not abuse drinking coffee. This beverage is a nice natural product. It does not require any processing for being very nourishing and invigorating. There is many minerals in coconut water, especially potassium, which is needed for your body to rejuvenate cells of all tissues. Even though it is rather popular to drink black tea before bed, this beverage is actually very invigorating. In fact, it contains a lot of caffeine, almost as much as coffee does. The thing is your body does not absorb this caffeine immediately, so a cup of tea can give you energy for longer than an espresso. We have mentioned in the previous paragraph that oranges are rather refreshing. Of course, fresh orange juice has the same feature. Make some in the morning and take it with you at work. With all the vitamins, especially vitamin C, orange juice will be a nice fuel for your body and your brain in particular. If you feel weary during the day, perhaps you do not spend enough time to stretch your muscles. With long periods of standstill, your body adjusts to a new regime, in which no movements are needed. As a result, even a small load makes you feel bad and tired. This problem is mostly visible for those who leads a sedentary lifestyle. That is why doing some exercises is very important to maintain physical and mental health. However, there is also something that can help you get an immediate energy. Stretch your neck. Perform some simple round moves with your head. Tilt it forward, backward, to the left and to the right. Then use your palms to rub the neck until you feel it getting warmer. This way you make your muscles ‘wake up’ after a long time of sitting. These simple exercises affect your whole body, as cervical vertebrae contains many nerves. Stand up on your toes and raise your hands as high as you can. Tilt your hands slightly back, as far as you can, keeping them straight. Then lean forward with your whole body and try to touch the floor. This way you stretch your back nicely, which also affects the whole body and gives you a powerful charge of energy. You can repeat this exercise as often as you need. When sitting, straighten your legs on the floor until you feel your muscles tense. Then tilt your feet apart, trying to reach the floor with little fingers. This way you can stretch your legs nicely without even standing up. This exercise is easy to perform at the office, but it gives you a lot of energy too, as blood starts circulating through all the veins. Cold shower is always a good idea if you feel tired. It makes your muscles tense and your blood starts circulating faster, as all the veins narrow. To enhance the effect, take a hot shower and then immediately switch water to cold. This is the best way to ‘wake up’ and feel cheerfulness. If you feel like there is too much work and you have no energy for it, perhaps this is only a mental weakness. You need to relax and think about something good for at least a couple of minutes. Sit or lay down and remember some happy moments. Think of what is important in your life. Do not let your everyday problems disturb your consciousness. This technique does help your brain refresh, which means you get energy to work again. The lack of energy may be a result of not having a good sleep. If you spend your nights working, eventually your brain will refuse to work properly, as it has no energy. It is also important to always go to bed at the same time. You should stick to some regime, so that your brain knows when it gets a moment of rest. Even if you sleep for only 5 hours a night, but go to bed at, say, 11 p.m., it is much better than sleeping for 6 hours randomly. Scientists claim that regular singing makes us feel happier and healthier. Moreover, if you feel tired, you can listen to your favorite song and sing along. This is the most effective way to tell your brain that everything is fine. The louder you sing, the more energy you will get, so do not hesitate. Motivation is important for any work. Without it, you will not be able to do anything properly. What is more, you will get tired a lot faster. Therefore, you should learn to motivate yourself. Even if you have to do something boring, think about how much money you will earn for that, so you will be able to spend it on something cool or buy a present for your nearest and dearest. Walking stimulates almost every muscle. It is the most usual movement for human. Therefore, if you walk at least 5000 steps a day, your brain knows that you lead a healthy lifestyle. That is why you get more energy, as you do need it for the muscles. If you need to get an immediate energy boost, go stroll for 15 minutes. Sometimes nothing can help you boost your energy better than a simple relaxation. When there are too many things to be done, you need to relax for a moment in order to get ready for a set of work. It is also a good idea to switch between two different tasks gradually. Do not start doing something new without a 5 minutes rest. Sometimes you need that energy boost immediately, for example, when you have to prepare the project in a few hours. It is when there is no time for walking or meditating. If you face such situation, do something of the following. These simple and fast ways can make you get some energy in a tick. Before you think that napping is no good when there is no time, let us say that a 15 minutes nap is enough for your brain to 100% refresh. Even though your body will still be tired, you will be able to do any task much faster. Such nap gives you energy for more than 3 hours work, which is sometimes just what you need. Before starting to work hard, watch a funny video. Scientists say that laughing is a powerful way to boost your energy. Your brain relaxes and refreshes, so you can return to work immediately. Therefore, these YouTube clips with cute cats do have a purpose . We have mentioned that a cold shower is a nice way to invigorate yourself. However, if you have no time for it, you can simply wash your face and neck. There are thousands of nerves, so it still works pretty well. In addition, rinsing your mouth refreshes your brain too, as it decreases the temperature, making blood in veins flow faster. Simply straighten your back as often as you remember. When working at the table, you will always lean forward unconsciously, which makes your body relax and your muscles stop working as they should. So, if you sit straight, you accelerate the blood. It gets to every muscle and gives you a feeling of refreshment. The other efficient way to get some energy is to stop thinking for a few minutes. Just turn off your mind, forget about anything, close your eyes or look at the watch. After a couple of minutes, you will get bored and your brain will want to do something; do not. Stay like this for another 3 minutes and then get to work. This way you will do anything much more enthusiastically. Nowadays, as many people lead a sedentary lifestyle, it is a common problem to have no energy and feel tired. Hopefully, everything mentioned will help you fight this feeling. 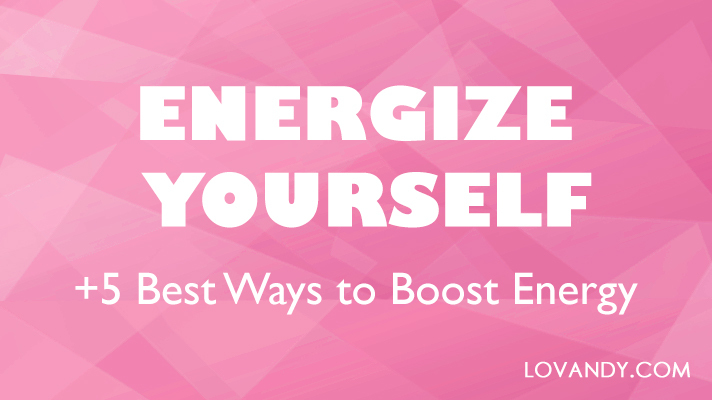 Notice that each way of boosting energy is effective. You can combine them to make it work for you. Tell us what helps you get some energy the most!